To make palak purée, pressure cook palak with salt and water. This will retain the green colour of palak. Switch off the flame after one whistle. Cool it down completely, blend in mixer and make purée. Take wheat and channa flour, add all the masalas and oil to it and mix properly. Add palak purée to it and knead the flour into firm semi tight dough, add water as needed. Cover and keep it as is for 10 to 15 minutes. Knead the dough again and divide into small lemon size balls. Roll the puris of size 3″ to 4″ in diameter. Heat sufficient oil in a wok and deep fry palak ki puri on medium heat from both the sides till it is golden and crispy. Strain the puris on an absorbent paper to let go of extra oil. 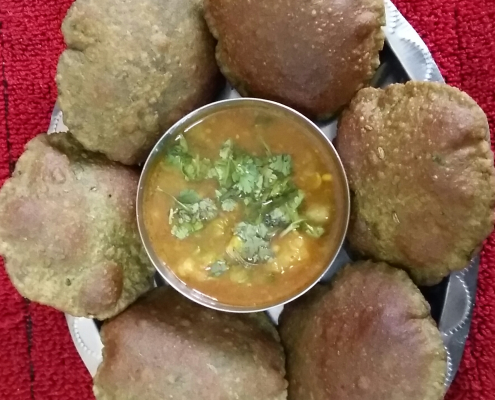 Serve hot palak ki puris with aloo ki sabzi.